Demand is pretty high and the hats sell out really fast (within a few minutes) so reading this info will help your chances and answer your questions! These hats are one of a kind, hand made, and will ship out the next business day after your purchase. How much are your hats? Do you ship internationally? The price ranges from $45-75 depending on the size of the design and the type of hat! And yes I do ship internationally. How can i order a Custom Hat? Once every 1-2 months I open up my shop for custom orders. 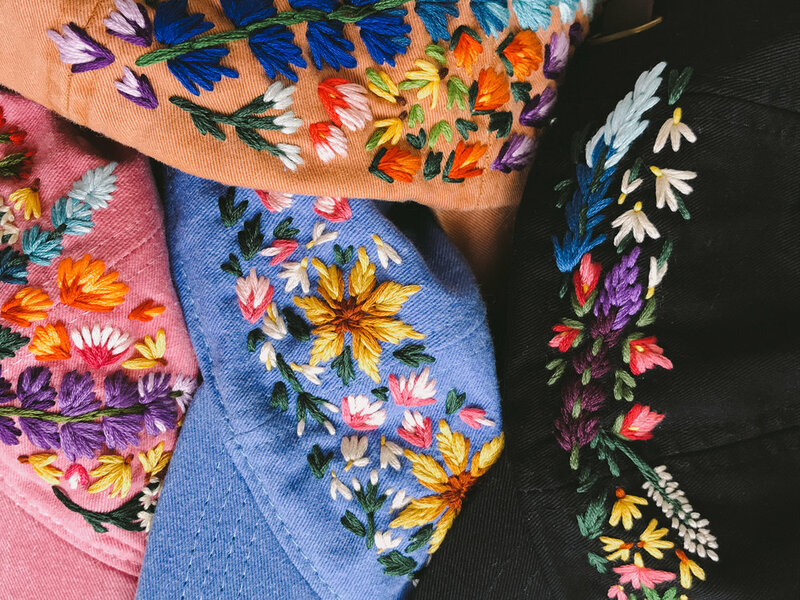 If you purchase a custom hat, you will be able to choose the hat color, color scheme, types of flowers, and location/size of the design. This option will take about 6-8 weeks to get to you, it adds you to my queue of custom hats and I create them in order. This sells out very quickly, I'm talking in a few minutes, so set an alarm on your phone or calendar if this is the option you want! During my last shop update I had a few people reach out to me because the hat they were purchasing sold out during their check out process. Unfortunately, due to the format of Etsy, and most other online storefronts, the item is not considered sold until the checkout process is complete. If you have a service like PayPal, or Apple Pay, use that! It is significantly faster than manually entering your credit card info! I highly recommend Apple Pay. Make sure you know your passwords for these services and have your shipping info up to date. If you do not have an Etsy account, I recommend creating one and entering your shipping information into it. If you are logged in while shopping that will be one less step. There is no need to enter the custom order info during your purchasing process, just send it to me in an Etsy conversation after you complete your transaction. Know what you want! The night before the shop update I will email the options for hat colors and design options, so you can be quick when the time comes! How can I order an already made, ready to ship hat? If you want something more quickly and you like any and all flowers, I will also be creating one of a kind hats and putting them for sale on my Etsy. My email list will receive an email the night before letting them know information on the sale the next day, including a preview of the hats that will be for sale. In this situation, you buy the hat and it goes in the mail the next business day. Super great for birthday gifts, last minute purchases before a sunny vacation, or just a late night treat yaself moment. Any additional questions? Let me know if you have any special requests! I receive a lot of messages and emails so it may take a week or so to get back to you, thanks for your patience!